It’s for fun, it’s for family, and it’s for showcasing the league’s best talent. But skill sets aside, one of the most unique aspects of the weekend is the curtain being lifted on the friendships that span uniforms and generations – like the bond between Oliver Ekman-Larsson and Mike Smith’s children. Playing with Mike Smith for over 5 years, Oliver Ekman-Larsson has learned to love the Smith boys like family. Don’t let those adorable faces and picture-perfect locks fool you though, the youngest Smiths are adorable but can be quite a demanding bunch! The Smiths weren’t the only ones making friends. Old friends got the chance to reunite as well, even if it was just “for the weekend”. Brian Boyle’s remarkable first career NHL All-Star appearance was made possible by his triumphant return to play after successfully undergoing cancer treatments earlier in the season. The former Tampa Bay Lightning player was a late addition to the Metropolitan Division, replacing New Jersey Devils teammate Taylor Hall, who is currently recovering from injury. The skills competition introduced a few new challenges, and a $25K prize for each winner. With a time of 13.454, Connor McDavid repeated his performance as the winner of the fastest skater competition for the second straight year. Alex Pietrangelo crushed the passing challenge with a time of 46.610, while Johnny Gaudreau’s slick mitts helped him to come out on top of the puck control relay with a quick 24.65. Rookie Brock Boeser, appearing in his first NHL All-Star Game, dominated the accuracy competition by hitting five targets in 11.136, while breaking a target with his laser-like precision. For the first time since 2002, a forward took home the bragging rights for hardest shot when Alex Ovechkin hit triple digits clocking 101.3 MPH on his second attempt of the night. Meanwhile, Marc-Andre Fleury proved the most durable in the sole goaltending challenge, the newly introduced save streak competition. The Golden Knights netminder strung together 14 consecutive saves, accompanied by an interesting song choice – the title track to the Disney movie, 'Frozen', as a nod to his two young daughters. "Let It Go" starts playing at the Skills Competition. Overheard in the media press box: "Frozen?" In-game announcer: "Marc-Andre Fleury wanted to listen to Frozen for the Save Streak challenge." "I thought the title, 'Let it Go,' was very soothing for goalies at the All-Star Game. I thought I was going to get lit up so I just had to let it go," Fleury explained to NHL.com. Golden Knights fans may be hearing a bit more of the song at T-Mobile Arena throughout the remainder of the 2017-18 season. "I'm going to ask Vegas to put it on when we go to shootouts," Fleury said. "Helps me relax." 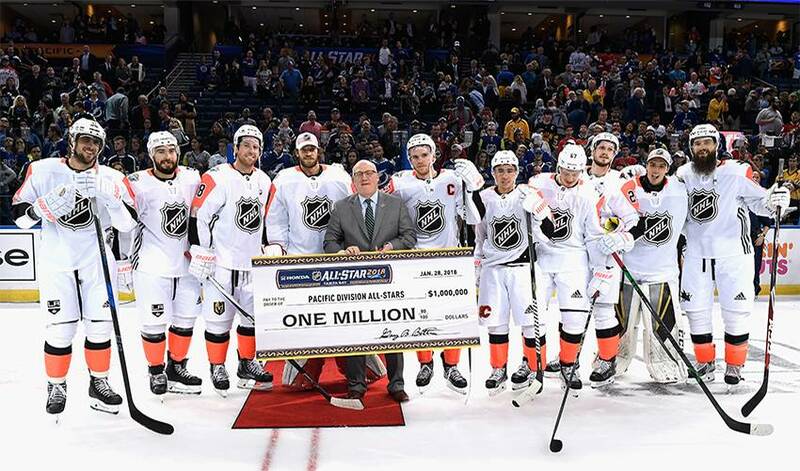 For the third straight year, the NHL All-Star game featured a 3-on-3 format with players from each division filling out the rosters with a grand total prize of $1 million. The main event got started with Nathan MacKinnon opening the scoring for the Central Division, but the Pacific retaliated quickly and eventually built to a 5-2 win with help from team captain Connor McDavid, who tallied four helpers, and a pair of goals from James Neal. The second matchup pitted the Atlantic and Metropolitan divisions, where much to the delight of the home crowd at Amalie Arena, a Tampa Bay Lightning player lit the lamp four times en route to a dramatic come-from-behind 7-4 victory for the Atlantic. Nikita Kucherov netted the game’s seventh goal to complete a hat trick in what was his second All-Star Game appearance. It came down to a duel between the Pacific and Atlantic for all the marbles. Boeser, who also netted the game-winning goal in his division’s first matchup, surfaced on the scoresheet again with a goal and an assist in a 5-2 victory. The Vancouver Canucks’ winger was voted the 2018 NHL All-Star MVP for his standout performance, and a great head of hair probably didn’t hurt his case – it even has its own Twitter account. For more highlights from this weekend, check out #NHLAllStar.